Your first love might not be your last love. This is true in more than just relationships; it is true about your career, too. When I was 17 years old, I fell in love with the idea of helping people. At that point in time, helping people, to me, meant that I should become a social worker. I applied and accepted my offer to attend Trent University for Social Work. I moved away from home, made wonderful friends, and for the most part, enjoyed my introductory courses. But something just didn’t feel right. I remember being half way through my first semester of university and feeling as if I was having a midlife crisis at just 18 years old. After learning more about the profession of Social Work, I quickly realized that it wasn’t for me. I wanted to help people, but I couldn’t see myself in a career as a social worker. I felt lost. I needed to break up with my program. Break ups aren’t easy. In this case, I needed to reflect and assess. I asked myself – what interests me? What type of job do I see myself in? If you’re asking yourself these questions, take your answers and do some research. That way you’ll have a better idea than I did of what you’re in for. Social work and I just weren’t compatible. I looked back at the things I enjoyed in high school. When I think about this now, I laugh to myself. My favourite courses in high school were related to communications. When I was applying to post-secondary the first time, I didn’t even consider communications as an option. This time around, I wasn’t going to make the same mistake. I applied to the Communications and Digital Media Studies program at the University of Ontario Institute of Technology. My friends at Trent told me many times: “you’d be a great social worker!” I had to remind myself that it was okay to switch paths. You’re not stuck in the program or the career (or relationship) that you started. If you don’t love what you do, reassess and reflect. Sometimes that means taking a risk. This was a risk. I still wasn’t sure if even communications was right for me. I decided to volunteer to gain some experience with communications by being in charge of all the marketing for a student run snack bar. This volunteer experience was one of my favourite experiences from my first year of university. It made me more comfortable with my decision to transfer schools, and it was a good thing to add to my resume. Personally, some of my best experiences have come from doing something way outside my comfort zone. Despite this program switch, I still had a desire to help people, but my definition of helping people had changed. I didn’t need to be an emotional support person or a social worker. I could help in other ways, and I did. I fulfilled that need by volunteering as a Peer Leader at the university, helping students through mentorship. 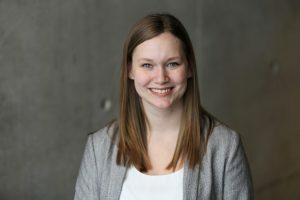 Now, after graduating in June of 2018 and starting my job as the Digital Community Coordinator at the University of Ontario Institute of Technology, I get to help people by advising my colleagues on social media strategies, and working with students to help them share their stories and their experiences on our website. I get to combine my passions for marketing and helping people through mentorship in my role. Your definition of love, or helping people, or whatever your passion might be, might change over time as you learn about opportunities that you might not have known even existed, and that’s okay. Trust yourself and find the career that fits you, not the other way around.